Type II Cans have two openings! 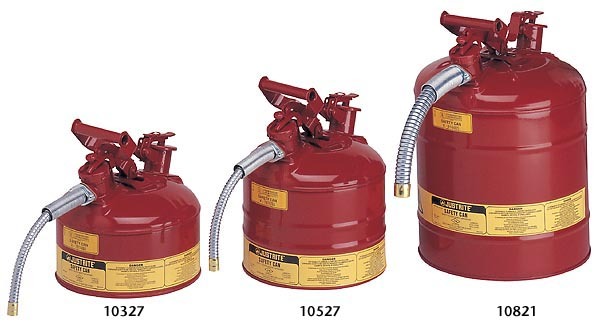 Compliant Type II steel safety cans offer additional convenience with two openings at the top. One opening is equipped with a flexible metal hose for smooth, accurate pouring into small apertures. The hose also provides a bonding path to a receiving vessel. A second opening, positioned behind the handle, is used for filling. All Type II Cans have a swinging handle to ease carrying a full, heavy can. During pouring, Justrite's unique design uses the weight of the liquid to counterbalance the pressure required to open the spout. Both openings are equipped with dual-density flame arresters which reliably dissipate heat to prevent flashback ignition. Both openings self-close to prevent spillage and the rear opening automatically vents between 3 and 5 psig to guard against pressure build-up at elevated temperatures and potential explosion. 双罐口安全罐 Heavy-duty, coated steel with reinforcing ribs and tough powder paint finish offers exceptional on-the-job durability. Justrite's quality is backed by an exclusive Ten-Year Warranty. All cans meet OSHA and NFPA, are FM Approved and UL/ULC Listed.